"This recipe has 1 cup natural bran which makes this recipe good with fiber. Also can use applesauce or sour cream instead of vegetable oil. I found that a little applesauce with the chopped apples and a little streusel topping in the middle makes a nice middle of muffin if you would like to make a gourmet muffin. I have found"
Whisk flour, bran, 3/4 cup brown sugar, baking powder, baking soda, 1 teaspoon cinnamon, and salt in a large bowl until thoroughly combined. Beat milk, vegetable oil, and eggs in a separate bowl. Pour liquid ingredients into the flour mixture and stir just until mixed. Gently stir apples into the batter and fill prepared muffin cups about 3/4 full. 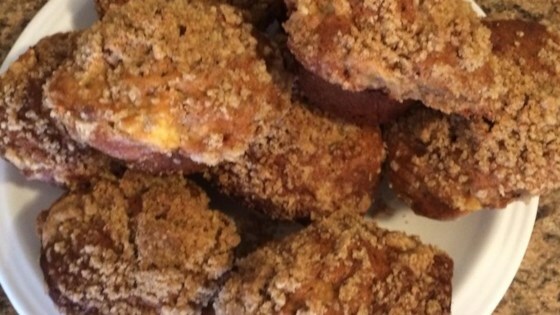 Mix 1/4 cup flour and 1/4 cup brown sugar with 1/2 teaspoon cinnamon in a bowl; cut the butter into the brown sugar mixture until the streusel topping is crumbly. Sprinkle about 1 heaping teaspoon of topping onto each muffin. Bake muffins in the preheated oven until browned and a toothpick inserted into the center of a muffin comes out clean, 25 to 30 minutes. Great recipe. They are super tasty. I did however bake them at 350 for about 23 minutes and they were perfect. Wow! These are so delicious! Such a wonderful way to use up left over apples. This is the best recipe ever for bran muffins. I followed the recipe exactly and they came out great! I am so happy. Super quick to make and my 14 month old is loving them! First time ever commenting on a recipe. This is a great one! Did everything the original recipe called for except used butter instead of shortening. Delish!